Finally signed on the dotted line! Several weeks ago I took the plunge and signed the contract for my new yoga studio. Now that I have the location I can finally get started on the renovations. I now have the motivation to continue and get things done. My new location is c/ Rosa Sensat 4 in Port Olímpic, Barcelona. The location is close to the beach, with tons of light, 200m2 and it opens right into Centre de la Vila, Icaria Cinema Yelmo. Which means the foot traffic is fantastic! I am opening a 40°C studio in Barcelona. 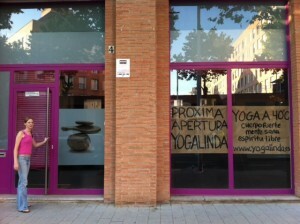 There is currently really only one hot yoga studio in Barcelona at 40°C and that is Bikram in the centre of the city. I am super excited and happy that I found my perfect location. During the searching process I had so many problems with the real estate agents customer service that I decided to write an article for the Barcelona Metropolitan online website. The article describes five do’s and don’ts about finding your perfect retail/office location in Barcelona. It should be online in a couple of weeks. I hope to help other people with the hassles of finding the right locale as it took me almost two years to find mine. I will try to post regularly now with photo images during the renovation process so you can see the whole process from start to finish. YES I am doing it! Following your dream is so fantastic. Just do it!